LAWRENCE, Mass. 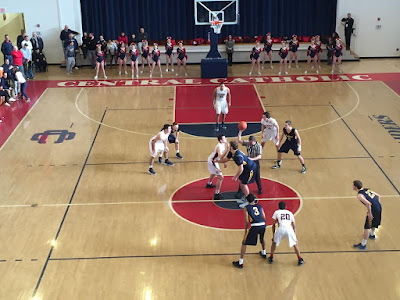 - Central Catholic and Andover faced off for the fourth time this season in a Division 1 North quarterfinals bout on Saturday afternoon, and for the fourth time, the Raiders edged their rivals in a gutty victory, this time by a final score of 58-47. Yet it was far from a sure thing. The No. 11 Golden Warriors (13-9) fell behind 37-22 at the start of the second half, but climbed back with a 14-4 run to make it 41-36 heading into the final frame. The Raiders' (19-5) lead continued to evaporate when Andover senior DeVon Beasley (14 points) came up with a steal at midcourt and skated in for what looked like an easy lay-up that would’ve made it a 49-47 game with just over three minutes remaining, but Central Catholic senior Sam Lara had other ideas. Lara, who poured in a game-high 25 points with 12 rebounds and four blocked shots, came flying in for a chasedown block to deny Beasley and electrify the home crowd. A few plays later, junior Dom Keegan hit his second clutch three of the quarter to put Central up 52-45 and the Raiders were able to salt away the win from there. On the other side of the ball, Lara and teammate Colin Bradanese (8 points, 5 rebounds) did an excellent job of limiting Andover’s 6-foot-8 center Max Beati, who carried the Golden Warriors to a first-round victory over Methuen with a career-high 31 points, but was held to just seven points at Central Catholic. By limiting Beati and forcing the visitors to shoot contested jump shots, the Raiders were able to turn defense into offense and build a 29-18 lead by halftime. Now the Raiders will advance to face No. 2 Everett in the D1 North semifinals at North Andover High at a time to be determined. But Nault is happy to let this victory soak in for a bit. “[Andover] is a great team and [David] Fazio is an incredible coach," Nault said. "There’s always a mental block for us when you’ve beat them three times and you think you can automatically win the fourth, but that’s not the case with that program. We knew this was going to be a dogfight and we prepared for that." Behind the poised play of junior point guard Bret Edwards (4 points, 6 assists) and the hustle of Lara amongst others, the Raiders emerged victorious from another Merrimack Valley Conference dogfight and will dance on into the next round.